H.A.T.E. 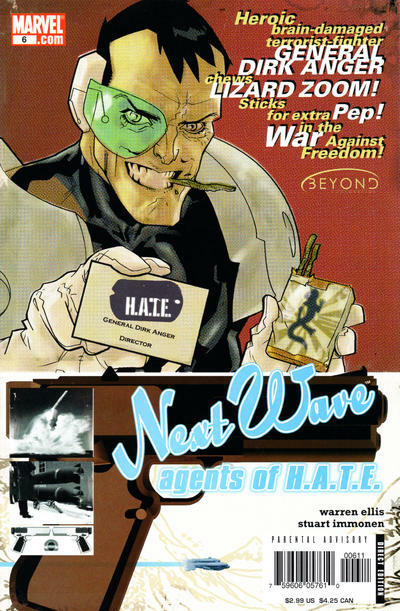 director Dirk Anger orders the release of “the Neo-Hyde Gutspawn…Human scum empowered by the cloned chemically-mutated cells found in the stomach walls of the corpse of Henry Jekyll himself!” Nextwave is a team composed of mostly pre-existing Marvel superheroes, and therefore this series cannot take place in the CU. It's actually debatable whether this happens in the Marvel Universe proper. It's a varied skewed satirical take on Marvel superheroes. 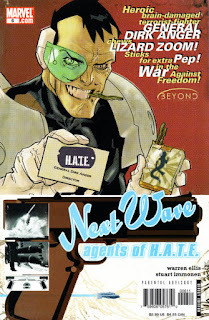 The semi-official line is that something vaguely similar to Nextwave happened in the 616. Photon, Machine Man, Elsa Bloodstone, Boom-Boom and the Captain were a team and they did... stuff, but what's real and what's elaborate fake memories is still undetermined. It's a great book on its own but it gets better if you've read any of Ellis' other work, especially Stormwatch, the Authority or Planetary. It's as much of a self-parody as a parody of Marvel.